﻿ About Us　-　ELECOM WEB SITE! According to GfK Japan Certified, ELECOM was the largest market share holder with 32.6% share of mice, 34.0% share of PC keyboards and 22.4% share of Amplifier speakers in 2010. “GfK Japan Certified” ranks the top 3 manufactures of consumer electronics and PC related products. The market shares are based on unit sales in major Japanese retailers from 01/01/2010 to 31/12/2010. ELECOM has been awarded the “BCN Award 2011” in 9 product categories. The BCN Award is a contest by sales units of products, which is based on POS data collected from major Japanese retailers. 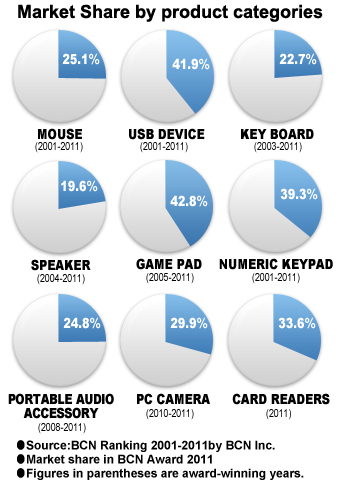 We have kept the largest domestic market share in the mice and USB devices categories over 11 consecutive years, keyboards over 9 consecutive years, speakers over 8 consecutive years, game pads and numeric keypads over 7 consecutive years, portable audio accessories over 4 consecutive years, PC cameras over 2 consecutive years and card readers for the first time. In the highly competitive Japanese market, ELECOM products are strongly supported and widely accepted by end users.